A recent study analyzed the chocolate consumption of over 20,000 people for a period of 11 years, on average. 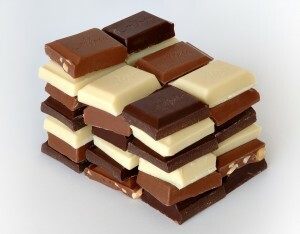 Participants consumed a median of 4.6 grams (about 1.25 individual squares on a standard bar of Hershey’s chocolate) of chocolate per day, and had their cardiovascular health assessed.4 The data used in the first study looked at the effects on HDL and LDL with the participants self-reporting their consumption of chocolate. Participants that consumed a higher amount of chocolate had an increase in cardiovascular health, a lower body mass index (BMI), as well as lower blood pressure. However, the self-reporting of chocolate consumption leads to errors in reporting and inconsistent measurements. The study also failed to report the specific type of chocolate the participants consumed, making it difficult to pinpoint the exact cause of the reduced health risks. In order to produce a more reliable study, the researchers should have produced a specified amount of chocolate to each participant as well as recording the specific kind of chocolate. Of the more common types of chocolate, dark chocolate is more extensively studied for the benefits that it may provide, but that kind of chocolate may be irrelevant. In a similarly conducted study in Japan, researchers gave participants 13, 19.5, and 26 grams of chocolate per day.5 Similar to the first study, those who ate more chocolate saw a greater increase in cardiovascular health. Those who ate at least 13 grams of chocolate per day found approximately 3.23 mmol/L decrease in LDL cholesterol. Some limitations of the study was that the study participants were given cocoa powder, which is not readily available to most people, as well as the cocoa powder being added to hot water, and not taken as a piece of chocolate that is easily available to all people. In order to gain all the heart benefits of chocolate, each person should attempt to get approximately 1.5 grams of chocolate per day. Although a consistent consumption of chocolate could provide an increase in heart health, the benefits may not apply to everyone. Different health conditions may not allow for self-care with chocolate consumption. Given the results of the research, it is inconclusive that the impact of dark chocolate on heart health is greater than milk chocolate. The studies performed in the articles allow a safe assumption that either kind of chocolate would provide the same benefits. The health benefits stemming from cocoa powder and not from the color of the chocolate allow for a greater range of chocolate that will provide heart healthy benefits. The recommended daily amount of chocolate from The Cleveland Clinic Wellness is 1.5 to 3 ounces to ensure maximum heart benefits from chocolate (Godiva sells chocolate in 1.5 ounce size).6 The small amount of chocolate provides us with right correct amount of chocolate to ensure heart health, without the excess sugar that comes with eating too much chocolate. Although it is important to take self-care measures to reduce your risk of heart disease, do not rely solely on chocolate as your cardiologist. Before beginning any self-care regimens, contact your primary care provider to ensure that the measures you are starting are safe and the best options for your needs. Kwok, C. S. et al. Habitual Chocolate Consumption and Risk of Cardiovascular Disease Among Healthy Men and Women. British Medical Journal. 2015. Wanjek, Christopher. “Even Milk Chocolate is Good for you, According to new Study” Huffington Post. June 16, 2015. Accessed October 14, 2015. Hershey’s. Types of Chocolate. Available at: http://web.archive.org/web/20090126124820/http://hersheys.com/nutrition/chocolate.asp Accessed October 28, 2015. Smit, H. J., Gaffan, E. A., Rogers, P.J. Methylxanthines are the psycho-o Kondo. pharmacologically active constituents of chocolate. 2004; (176)3-4:412-19. Baba, S, et al. Plasma LDL and HDL Cholesterol and Oxidized LDL Concentrations Are Altered in Normo- and Hypercholesterolemic Humans after Intake of Different Levels of Cocoa Powder. The Journal of Nutrition. 2007;137(6): 1436-1441. Cleveland Clinic Wellness. Eating Chocolate can be Healthy. Available at: http://www.clevelandclinicwellness.com/Promos/Pages/Chocolate.aspx#. Accessed October 28, 2015.